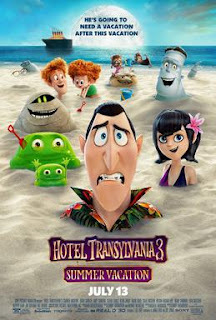 While I do not consider “Hotel Transylvania 3: Summer Vacation” to be of any real improvement over the previous two installments, I know we are now at the point where that no longer matters. By the third installment a movie series is essentially on autopilot. The feeling of having to prove yourself the first time has already been accomplished and the fear of toping yourself the second time around is also no longer an issue. If you’ve ever wondered why third installments in series are rarely any good, you only need to understand that at this point the film makers have a pretty good idea of what works and what doesn’t. Or – at the bare minimum - they know what they need to do to sell the movie to their audience, and there is rarely any desire to rock the boat. “Hotel Transylvania 3: Summer Vacation” does take the cast away from the title hotel and manages to put them on a literal boat, but don’t expect for much to change outside of the scenery. 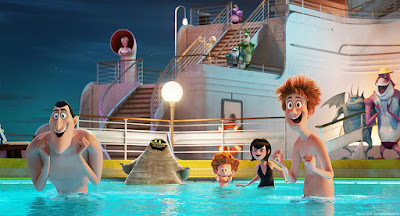 The animation is still moving like rubber, the story pacing still assumes everyone in the audience has ADD, and the characters are still wildly overreacting to things rather than interacting with each other. To some extent, I understand that director Genndy Tartakovsky directed himself into a corner; he wanted to make a series that paid homage to the classic Tex Avery and Chuck Jones animations, where everything was wacky, silly, and fun. In some regards, Genndy succeeded in that area. The problem is…it’s not a style that works particularly well with feature film (and likely never will). Movies require moments of silence and slowing down. Disney learned this with his first feature and most of the studios films (sans “Chicken Little”) understand that there is a moment you need to digest. The reason Chuck Jones was never able to successfully make a feature length Looney Tunes movie is because the style of humor the shorts were known for simply got tiring if you stretched it over for more than ten minutes (all Bugs Bunny movies made under him would be compilation films). But, if you want more modern-day proof, I refer you to “The Emoji Movie” from last year. 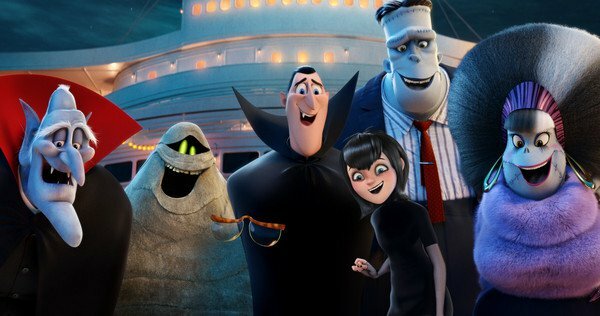 I never thought I would bring up the only animated movie to win a Razzie Award for Worst Picture in one of my reviews ever again, but before the movie was a ‘Hotel Transylvania’ short where Dracula gets his grandson a giant puppy. Nothing in the writing, direction, or animation was even remotely different in terms of style, tone, and prose. Yet it worked because it was only five minutes long. Giving audiences that much energy in an hour and a half is almost akin to torturing your body by drinking a full Big Gulp of Mountain Dew. It’s WAAAAYYYY more than what you need. So, the audience ultimately sits in the theater, taking in joke after joke, and after a while it’s hard for anything to stick. There are a few moments where I chuckled (because I’d have to be a Scrooge not to). There are two moments where the humor is based entirely around how characters are moving to music that was not only clever but slowed down just enough for me to catch a break. The story involves Dracula (Adam Sandler) wanting to date a human woman, and there are a few scenes where they are just talking to one another and the scenes are…rather sweet, to be honest. For the most part though, there really isn’t much to speak of. By this point you are either on board with the wacky humor or you are not. For me, I think my love for the characters is squarely in five-to-seven minutes shorts, and any long form of “storytelling” is nothing more than an annoyance as far as I’m concerned. I suspect kids will enjoy this like they enjoy sugar, but whether they actually get anything from it in the long term is a dubious prospect. Parents there are a few scary monsters, but the situations are so silly I doubt any kid will be bothered by them. Recommended for all ages.